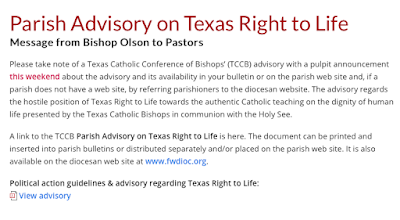 I come to you with a big update on the Parish Advisory debacle wherein the Texas Catholic Conference of Bishops ("TCC" or "TCCB") basically banned Texas Right to Life ("TRTL") from parish properties, made other statements about them that are demonstrably untrue, have yet to be supported with examples or facts, and gave its absolute endorsement to Texas Alliance for Life ("TAL") and Texans for Life Coalition ("TLC"). I have recently blogged about the Parish Advisory, what it says, and the implications of it here and here. 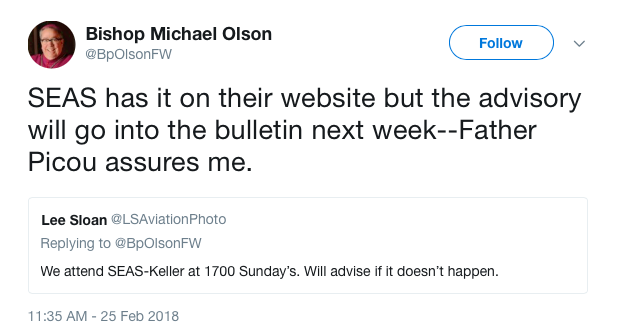 I have requested a meeting with Fort Worth Bishop Michael Olson on the matter about a dozen times. I have written a certified letter, tweeted, and emailed him. Others have made that same request of him. He has, as I expected, ignored those requests. I will take you through some of his more memorable tweets on the matter in a bit. Why? Because you need to know where your Bishops are on these things. You need to know what we're up against. And, you need to see why this has to become the beginning of a much larger movement to take back our Church. We are in crisis. That is not news. What may be news to you is that this issue has touched a nerve with people - not just because of its unfair attack on TRTL - but because right thinking Catholics see that this is emblematic of what is wrong with this Bishops' Conference (and so many others) and the Church as a whole right now. People want to do something to right this ship. More on that in a moment. Let's get to the update first. On March 2, 2018, EWTN (the Eternal Word Television Network, a Catholic media outlet) interviewed San Angelo Bishop Michael J. Sis about the Parish Advisory. In it, Bishop Sis makes a few rather shocking statements given the history of it all. 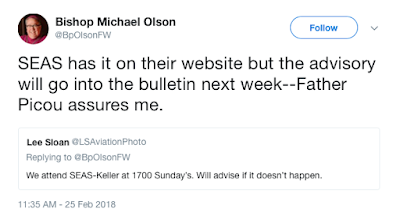 You will see in a moment the contrast between how he now characterizes this Parish Advisory versus how it has been handled by Fort Worth Bishop Michael Olson before it blew up on them. I want to get into all of that with you in some depth for a number of reasons. First, the Texas Conference of Catholic Bishops is clearly backtracking and trying to undo some of what Olson has done. 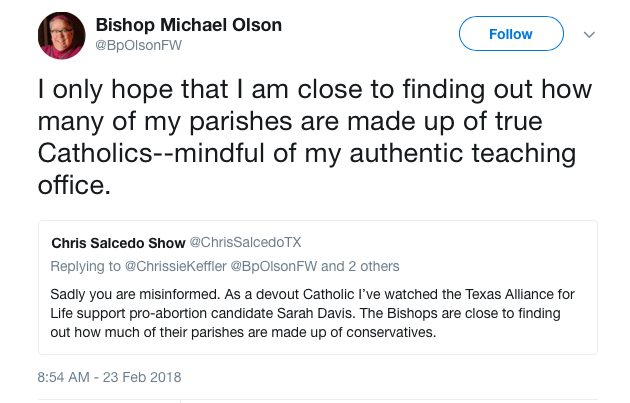 Second, however, Bishop Sis continues to promote a false narrative about Texas Right to Life - that is, that they somehow have sought to teach on or make statements about Catholic Doctrine authoritatively. That has never been done and despite repeated requests, no specifics have been given. Third, backtracking and "re-characterizing" the Parish Advisory is wholly insufficient. While it is mildly gratifying to see a bit of "crawfishing" as we'd say here in Texas (backing away from something), it is simply not enough. They cannot now act like this was something different than what they intended initially when they believed that everyone would just be in lockstep with them because they were told what to do. We will not err by clericalism. The TCC should know this. We have made some progress showing them this. Let's hold them accountable - as best we can - and I will show you how in a moment. But let's continue the examination of this interview with Bishop Sis. He begins the interview by saying, "First, of all I think it's really important to remember that this was a note to our pastors. It was not a public press release." That seems like it was intended to be pretty publicly released to me. Was the press then supposed to ignore it because it was not labeled "public press release"? 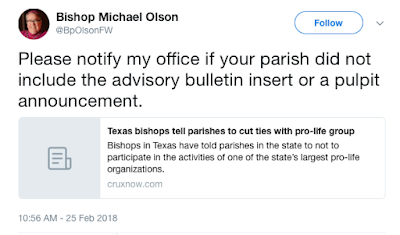 Although he was trying to "subtweet" Chris Salcedo, the point is, he was re-emphasizing how widely this Parish Advisory was to be disseminated - to at least the Catholic public. More on this in just a moment. No brother bishop called him up and said, "Hey, this was not supposed to be public"? Apparently not. A few comments on this. First, it is manifestly untrue that TRTL has ever tried to go onto a parish property and do this. The TCC gives no example of when that has ever happened. Second, Bishop Sis admits that teaching Catholic doctrine is "not in [TRTL's] job description." Exactly. It is not. That is not in their "What We Are" or "What We Do" statements on their website or what they do. So what's the problem? By Bishop Sis' own admission, TRTL does not seek to do this. This is clearly a manufactured justification for this Parish Advisory which was about other motives as you'll see. But let's go deeper. Search "Catholic doctrine" on the website and you get one result from 2016, which notes that former VP candidate Tim Kaine's pro-abortion views were at odds with Catholic teaching (that is indisputable) and warns of a fake Voter's Guide alleged to be from Pope Francis. Search Catholic doctrine (no quotation marks) and you get four results. One is the Tim Kaine article. The next result is an article by Bishop Emeritus Gracida who wrote in response to a public 2014 attack by an individual on TRTL and noted that: "Additionally, the Texas Catholic Conference of Bishops has no canonical authority or official status in the hierarchy of the Catholic Church, and as the political advocacy arm of the bishops of Texas, the TCC is not the magisterial arbiter of moral doctrine in Texas (or elsewhere), nor does the TCC hold any authority over individual Catholics." This is extremely applicable here. The TCC with this Parish Advisory has overstepped its authority and we are not bound by anything they say about morality. 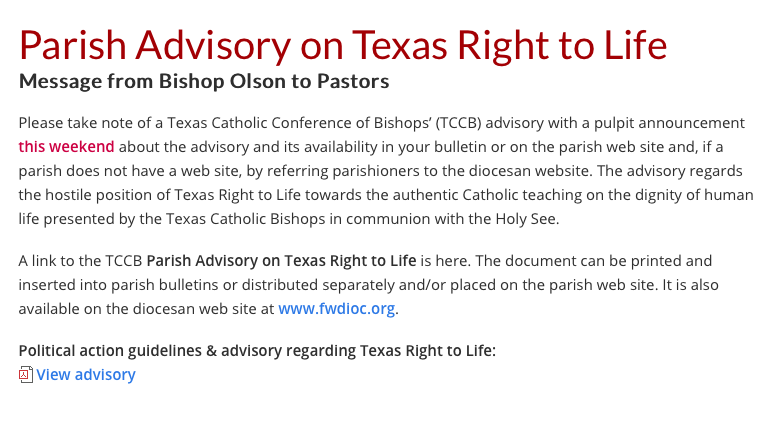 This is very important given that the TCC has stated in the Parish Advisory that: "Texas Right to Life is not to be confused with Texas Alliance for Life or Texans for Life Coalition, which are separate organizations and remain consistent with the bishops' positions." (Emphasis added.) As I noted in my prior post on this, "Thus, TAL and TLC were given a robust, unqualified, absolute endorsement in the Parish Advisory. That will become more significant as we delve deeper into the substance." I also noted that, " The TCCB - thankfully - does not go so far as to say these are consistent the the Church's position. This is a distinction with an important difference as this situation makes painfully clear." Given TAL's and TLC's positions on certain matters that the TCC states is consistent with theirs, the TCC is extremely compromised. I laid out a number of these issues in my prior blog post. An additional issue is that TAL's executive director testified against the dismemberment abortion ban. The third result is a 2013 article entitled "Hostile Orders" which first appeared at AmericanThinker.com and was reprinted with permission. It was not an original article written by TRTL, but it discusses DNRs (Do Not Resuscitate Orders) in the context of discussing the Catholic "principle of subsidiarity" in the context of the SB 303 battle raging at that time. In so doing, the article links to this article on the Vatican's website and quotes from it. Then it concludes that SB 303 violates that principle. I have said the same. It did. Finally, the fourth article is entitled "Planned Parenthood President Joins Ford Foundation." It noted that "'Catholics for Choice' advocates abortion in direct contradiction of established Catholic Church doctrine." Again, that is an established fact and the article notes that the U.S. Catholic Conference of Bishops has condemned them. 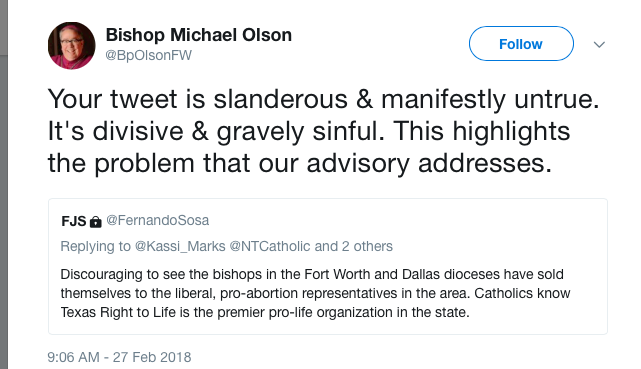 Indeed, Bishop Olson actually tweeted a link to this statement he made back 2016 just last week condemning Catholics for Choice. So surely, there is no complaint about this being some error in presenting Catholic doctrine by TRTL. So, what is the issue here? Where has TRTL sought to teach Catholic doctrine at all, much less incorrectly on parish property (or anywhere else)? Where did it seek to "define" Catholic teaching on parish property or using parish families or anywhere else as Bishop Sis claimed in his interview? TRTL, which, by the way, is made up of more than just Catholics, has mentioned Catholic doctrine in exactly four places on its website. Mentioned, not taught. 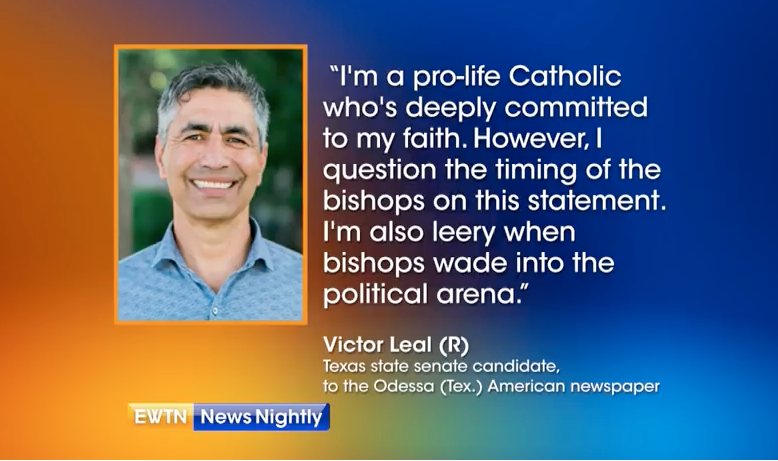 Two of those articles were written by others, one of whom is a Bishop in Texas. One article comports exactly with something Bishop Olson has written. The other notes that there was no Voter's Guide to the U.S presidential election from Pope Francis. So why the condemnation and banning from parish sites? Let's continue with what Bishop Sis said in his interview. The interviewer asked him: "So, your excellency, what will happen to those pastors who don't follow suit? Are there any repercussions?" Sis answered: "No, we have not put forth any particular policy of that nature." In addition to the very condescending tone, please note what Bishop Gracida said above about the TCC's authority. And this was a TCC document as evidenced by the letterhead and the tweet by the Austin Diocese above. Finally, a note on people's reactions. Many are familiar with the TCC's compromised position on these matters having allied itself with organizations that do not actually support life principles. In the past I have talked about the cozy relationship between TAL and the Texas Medical Association. TAL and the TMA were on the same side of SB 303 and other efforts to either introduce faux reform bills or undermine true reform bills. Please note that the TMA is a pro-abortion organization. Yet, TAL can be said to carry the water for this organization when it comes to certain legislation, including refusal to treat and end-of-life legislation. Remember that the TCC has all but said TAL speaks for it. Put that together yourself and see the implications for legislation and morality. If the TCC had any teaching authority, it has abdicated it long ago - but most recently through this ill-conceived Parish Advisory. Again, they have supported politicians who refused to even consider closing an abortion loophole allowing for the abortion of babies diagnosed with fetal abnormalities. Many of those legislators were endorsed by TAL which speaks consistently with the TCC's or bishops' positions. That means those are the TCC endorsements by the language the TCC used in its Parish Advisory. I covered this in my prior post. I noted that there were still no facts to support the allegations against TRTL, renewed my offer to meet with him, and asked him to stop attacking the laity as this was just further scandal. Perhaps coincidentally, shortly after this, he stopped tweeting about the Parish Advisory. Returning to Bishop Sis' interview, he next states that he wants to make sure that their pastors know that parishioners need to know that if an organization is recruiting there, that the organization is not representing the Catholic Church formally. But who thinks this? Many organizations use parish facilities - the Boy Scouts, Girls Scouts (despite their close association with Planned Parenthood), homeschool groups, mothers' groups, etc. But the truth is, this Parish Advisory banned TRTL from using parish facilities. It was no mere clarification. And, there was nothing to clarify as I have pointed out - TRTL has not sought to teach or define Catholic doctrine on parish property. Bishop Sis said it was not the point of the memo. to malign any organization, but just clarify the use of facilities and teaching. Really? Because it banned an organization, which certainly maligns them, as does accusing them of misrepresenting Church doctrine. Then it endorsed two organizations who the TCC says, without qualification, holds positions consistent with the Bishops, thereby stating, by implication that TRTL does not. 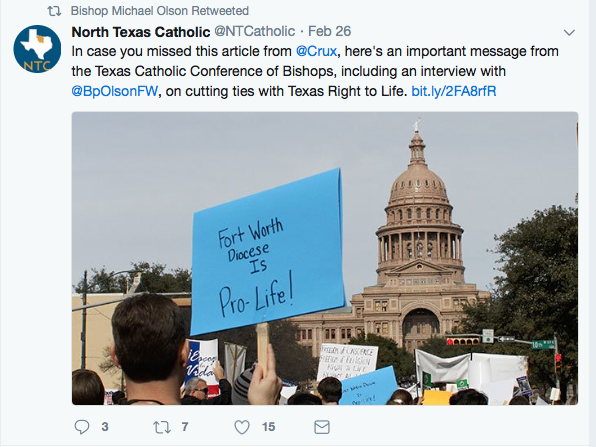 In this case, that is good because if the TRTL held positions consistent with the TCC I'd have to write about them and call them out and we'd have no one truly defending life in Texas. Bishop Sis then says that we need to keep in mind that the big picture is to build a culture of life. That's fine. That should be the goal. However, as I have demonstrated, that is not what the TCC is doing nor what this Parish Advisory did. Far from it. The Bishop concludes with a call for unity. That would be nice, but we cannot undermine sound pro-life principles just for the sake of getting along. You can't split a baby. You can't kill half a patient. On some matters, there is no room for compromise. Life issues are such matters. True incrementalism if we have to, but not in lieu of pushing hard for the best we can get first. So, there you have it. The TCC has backed off the Parish Advisory - re-characterized it (frankly, mischaracterized it) - but has not retracted it. Further, it continued the false narrative that TRTL has sought to teach or define Church doctrine with authority without any examples or proof of that. I could not find any myself as I explained above. So what was all of this about, I have been asked? Well, given that TAL and TLC hold positions consistent with the TCC, given that one big issue was the TRTL Voter's Guide, given that this Parish Advisory was released on February 22, 2018, during early primary voting, given that it was pushed hard in the two dioceses where there are some hotly contested races, and given that the organizations have endorsed opposing candidates, I think we all know what was at play here. Politics. Not principles, but politics. 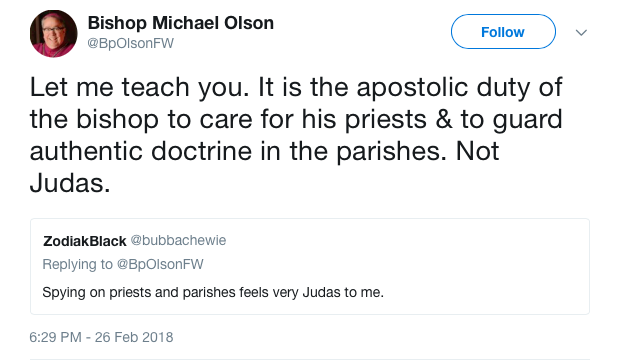 Go to Bishop Olson's Twitter page - look at the tweets and replies. People are truly scandalized. One poor guy said this was discouraging him from returning to the Church. That is just beyond scandalous and something for which clergy will have to account. 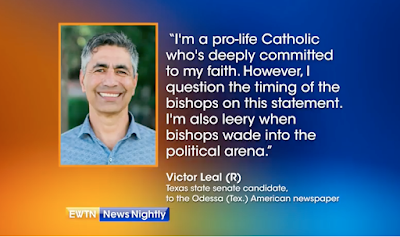 They are responsible for souls and lives, but not primary elections other than to accurately teach the faith and let voters use their well-formed consciences to make their choice. The TCC has lost way on what its duties are. This has been an enormous embarrassment to many Catholics. The TCC has refused to support its allegations in any way. Given all of this, there is only one thing to do. The TCC should fully retract this Parish Advisory and apologize for the scandal it has caused to everyone, from TRTL to the laity. That is the only right thing to do. I have never had a post so widely viewed and shared as my prior post to this one. Nor have I had so many people contact me in various ways to discuss this issue and thank me for bringing it to their attention and spreading the word. I have not been alone in my efforts. Representative Matt Rinaldi's letter has garnered a great deal of press. It was well-written and spot on. Plenty of other Catholic and political bloggers, followers, and commentators - Catholic and otherwise - have been shocked at this unprecedented display of raw politics and abuse of clerical power. The movement has begun to take back our Church. 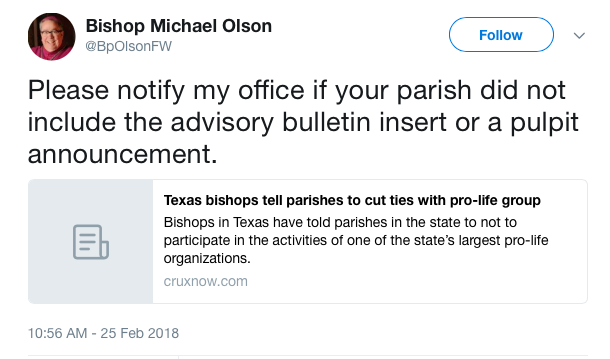 Please keep the pressure on all of our Bishops in Texas. Respectfully let them know that playing politics in this manner, ignoring sound Church teaching, and engaging in defamation and calumny is unacceptable. Respectfully, demand that they retract this statement and apologize to both TRTL and all of the lay faithful who have been scandalized by this truly unfortunate shocking display. Then ask them to find new advisors. Be forewarned. 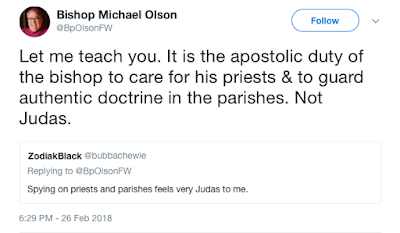 Bishop Olson is blocking some people from his Twitter page who dare to question him. Two of my friends have been and one in particular hardly said anything at all. If that happens to you, do not lose heart, however. Twitter is not our only means of communication. Screenshot your block notice, disseminate it, and then go on to call, write, email, and contact the Bishop and TCC directly. In fact, do all of this. This cannot go on. The Bishops are supposed to have missions from God that they need to focus on and not incite inter-organizational conflict as they have here.